Authors: Kim, K.; Murphy, T. E.
Abstract: Nanoporous silicon is known to have a thermal conductivity that is orders of magnitude smaller than the bulk crystalline silicon from which it is formed. Even though the strong columnar microscopic structure of porous silicon indicates the possibility of highly anisotropic thermal properties, there have been no measurements. We report here an experimental investigation of this anisotropy. An analytical heat spreading model with 3ω thermal conductivity measurement method was used to derive both in-plane and cross-plane conductivities. 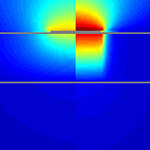 Additionally, we describe a finite element analysis that supports the experimental measurements. Our measurements reveal that because of the nanoscale columnar nature of the material, the in-plane thermal conductivity of nanoporous silicon is 1–2 orders of magnitude smaller than the cross-plane thermal conductivity and 2–3 orders of magnitude smaller than that of crystalline silicon, making it comparable to the best thermal insulators available.